I needed a quick card the other day so I got out those lovely Kanban dress forms with card to match. But this time I chose to use the Desert Blooms paper pack for the background. So you can see it didn't take long to put this together with the decoupaged dress form, bought flowers and a handmade sentiment and butterfly stamped onto acetate and cut out. Et voilà. Not like some of my projects that take days and days - but good to see something finished in lightning time for a change. A quick card and a quick post. Hope you are all well and see you soon. Hi Brenda....it doesn't look like a quickie... it is just gorgeous....hope you have a wonderful Sunday! Just gorgeous Brenda and definitely doesn't look like a quickie. Love the pretty dress form and your beautiful embellies especially the acetate butterfly. Nice combination for a quick and pretty card! A gorgeous feminine card Brenda, and it certainly doesn't look like a quick-make to me! Aww this is very pretty Brenda! Love the paper and those gorgeous flowers and the butterfly! Great design and layout! 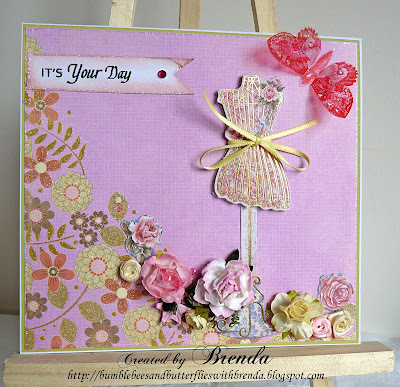 Oh gorgeous, beautiful card Brenda. I have a weakness for dressforms.